The Party’s Central Committee has nominated General Secretary Nguyen Phu Trong to be the country’s next president. 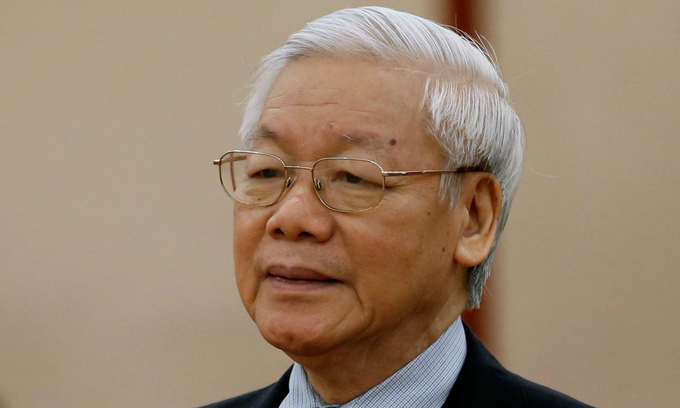 The committee voted on Wednesday to introduce Trong as a candidate for the head of state post to Vietnam’s legislative National Assembly, which will be in sesssion between October 21 and November 19. No other candidates have been proposed for the job. Vice President Dang Thi Ngoc Thinh is currently the acting President, serving as Vietnam’s first female head of state, after President Tran Dai Quang passed awaySeptember 21 due to a serious illness. This is the first time in many years that a Party’s General Secretary is recommended by the Central Committee to the National Assembly to serve as the president. The President is country’s top representative in both internal and external affairs, commander-in-chief of the military, entitled to appoint or dismiss the deputy prime ministers, ministers, and advise the National Assembly to do the same with the country’s vice president, prime minister, top judge and top prosecutor. Vietnam is now led by four “pillars”: its president, prime minister, Party chief and the national assembly chair. If approved, Trong will become the first Vietnamese leader to be the head of state and the Party since founding president and revolutionary Ho Chi Minh. Trong, born 1944 in Hanoi, studied Literature in university and spent many years working for the Communist Review, the political agency of Vietnam’s Communist Party, and was its editor in chief between 1991 and 1996. For several years, Trong has spearheaded a crackdown on corruption that has seen scores of top businesspeople and government leaders face criminal probe or even trial over allegations of financial mismanagement and embezzlement. The biggest casualty of the campaign so far is Dinh La Thang, a dismissed member of the now 17-strong Politburo, who is serving 30 years in jail for violations when he was chairman of the state oil giant PetroVietnam. Trong’s presidency nomination was made during the 8th plenum of the 12th Central Committee, a key Party gathering held between Tuesday and Saturday to discuss major issues including Party personnel, socio-economic development and national maritime strategy. Punishments for several top officials are also expected to be announced at the meeting, joined by 223 senior Party members.